As haunting a portrait of the desperation of poverty as the cinema has ever given us, Vittorio De Sica's Bicycle Thieves (1948) remains one of the supreme film masterpieces. 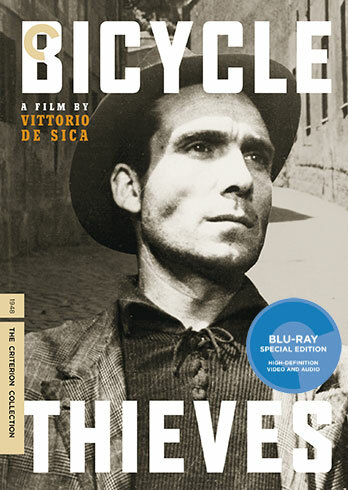 A product of a devastated post-war Italy, Bicycle Thieves took a hard look at the economically downtrodden, desperate to rise above yet constantly held back by circumstances beyond their control. In this case, our subject is Antonio, a family man who has finally gotten a job after being out of work. The catch is that he must have a bicycle, and his bicycle is at the pawn shop. After selling their bedsheets to get the bike back, it gets stolen on his first day on the job, leading to a frantic search across Rome, and an impossible choice that that will take him and his son to the depths of despair. De Sica would more blatantly pull the heartstrings in Umberto D. in 1952, but there's really nothing else that compares to the grim efficiency of what he achieves here. Sparse, melancholy, and strikingly real, Bicycle Thieves has the haggard, hangdog feel of a documentary, with a dramatic structure so subtle that its shattering climax almost comes as a blindside. Using non-professional performers and real locations, the film feels unquestionably authentic, which adds to its quietly immense power. Bicycle Thieves isn't so much an indictment of a broken system, but a cry of anguish at an uncaring world. It leaves us with such an air of hopelessness that it becomes a moral call-to-action. It may not be Brechtian in style, but there's still something distinctly Brechtian about De Sica's determination to remind us of a world outside the cinema, of the plight of those less fortunate, and the deck that seems so frustratingly stacked against them. The new Criterion Collection Blu-Ray may just be a direct upgrade from the earlier DVD release, with no new special features, but it's still a must have for any serious cinephile. Before Citizen Kane became the new reigning champ, Bicycle Thieves was considered the greatest film ever made for many years. 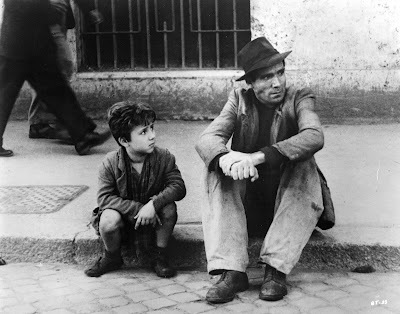 Even today, when other films have become more highly regarded in retrospect, Bicycle Thieves has always been one of those films that has endured to the point of immortality. Indeed, watching it again in 2016, its timeless power is even more evident. 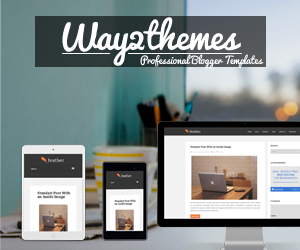 It's themes remain universal, its impact un-blunted by time. This is one disc that deserves a special place on any collector's shelf.